If you are a sewist on the go, this Everything Mary Rolling Sewing Tote will quickly become your favorite traveling buddy. Easy to move from place to place, this travel case is stylish and efficient. You will never have to worry about your sewing machine breaking, denting, or getting banged up in a tightly packed car or airplane when you get your hands on this lovely, rolling suitcase for sewers. It is designed especially for travel, meaning it tows the line between spacious and compact perfectly. In addition to efficiently carrying your sewing machine, this Rolling Sewing Tote comes equipped with an excellent system to carry many of your other sewing essentials. With pockets on the inside rim of the top of the carrier, this travel essential makes it easy for you to store and locate things like bobbins, thread, needles, and seam rippers in a pinch. The clear lining of the top storage area mean you will not have to go digging through a messy, extra tote bag or crowded pocket to find little things. Additionally, there are zippered pouches on three sides of this case. These spacious, zippered compartments are the perfect place to store scissors, patterns, fabric, and other larger pieces of sewing equipment. 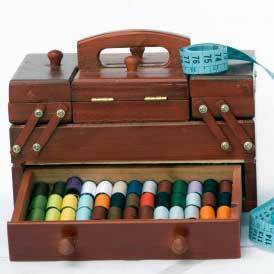 With everything in one place, the Everything Mary Rolling Sewing Tote almost makes it too easy to sew on the go. Whether you are bringing your sewing machine along on a vacation, need your sewing machine while traveling for work, or just need a compact place to store your sewing materials, the Everything Mary Sewing Tote will not disappoint. It is so cute and trendy you will want to roll it just about anywhere. This post contains sponsored links from Everything Mary. Our Disclosure Policy can be found here.